Limonite is FeO-OH-nH2O. It varies in color from very pale yellow to orange-brown, depending on the amount of water in the matrix. The flakes often contain darker, less hydrated nuclei. The form of the limonite particle reflects the shape of the interface between the oil and the water layer. These flat sheets indicate a very flat, smooth interface. Limonite is FeO-OH-nH2O, the first form of iron corrosion product evident in a corroding transformer. It is an iron hydroxide with waters of hydration. The initial form is pale yellow in color. As waters of hydration are lost it becomes more orange and will eventually become hematite (Fe2O3). Limonite is amorphous or cryptocrystalline but as it looses more water the nuclei convert to a more evident crystal structure. There are at least five forms of FeO-OH that have distinctive crystal structures. They include limonite, lepidocrocite, goethite, and others. These limonite particles show two of the hydration conditions. The more orange particle has released some water and hydrogen back into the system. Free water is accumulating on the surface of sheet iron and is corroding the iron. 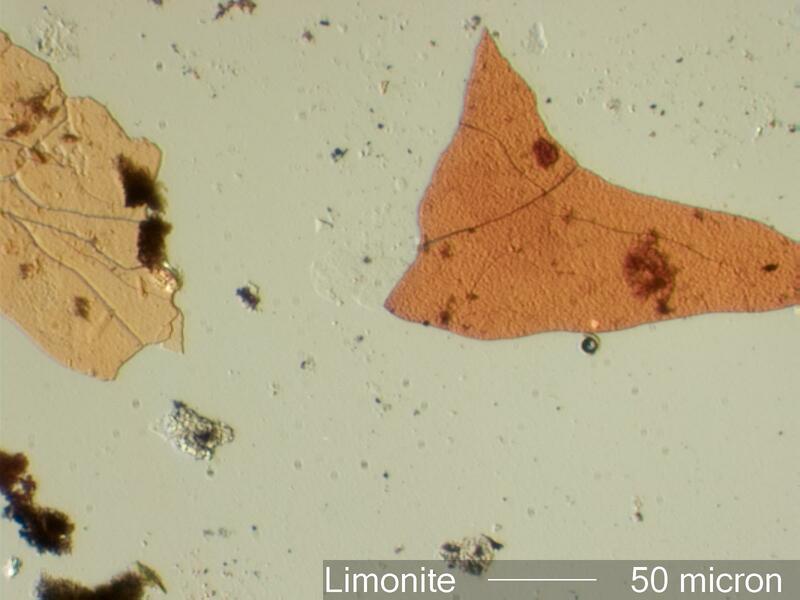 Growth of crystal sites in the limonite film indicate that this has been occuring for at least many months. The presence of pale yellow limonite suggests that the corrosion is still occuring.